Working at Canterbury Oast Trust you can. We can offer a varied working environment and a thriving community. 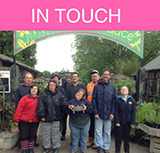 COT is a charity that supports adults with learning disabilities. We support people to live fulfilling lives. We provide quality registered care homes, independent living homes and, through our 6 commercial enterprises, we offer development opportunities. The Board of Canterbury Oast Trust is keen to welcome new trustees to complement our existing skills and experience and to support the ongoing development of the organisation. As we move forward with our strategic plans, we would be particularly keen to hear from those with experience in finance, tourism and care (ideally experience in adult social care as a local authority commissioner or similar, but more general experience with adult social care would be welcomed). If you are interested in applying to join us as a trustee and have knowledge in these areas - or other skills / charity board experience which may be of benefit - you are invited to contact the Chief Executive in the first instance. Current trustees will then arrange to meet you for a chat, to help you find out more about COT. With some exciting plans already underway for the next 3 – 5 years it’s a great time to ‘get on board’! We employ over 250 staff on a variety of contracts and many of our team members have been with us for a long time, giving the trust a real sense of community. Our Head Office is at Woodchurch, near Ashford. We have 17 properties that support over 90 adults with learning disabilities in Rye, Aldington, Ashford, New Romney and Woodchurch. We provide people with supported accommodation which is personalised to their needs. We can offer long-term residential care or a Community Support Service. We pride ourselves on the quality of our care and the small, family style homes we provide. Our philosophy is simple - that people with disabilities have the right to a fulfilling life and to play a meaningful role in society. The Trust also offers a range of innovative Life Skills development opportunities that enable people to develop a range of skills. These opportunities are open to all adults with a learning disability (subject to space). One of the great things about COT is the variety of roles, whether you are a new starter or practised professional. Canterbury Oast Trust is committed to creating an inclusive working environment to maximise the potential of all staff, providing equal opportunities in all aspects of employment and avoiding unlawful discrimination at work. 60% on the Care team (Support Workers/Team Leaders/Home Managers). Our care staff are at the heart of maintaining our quality service and operate from all our locations. 20% on the Life Skills team (including practitioners and tutors in Horticulture; Arts & Crafts; Farm work; Woodcraft; Catering, Information Technology and Retail). Life Skills staff work to provide choice and development opportunities for our clients. These activities are based at Woodchurch, Aldington and Rye. 10% on the Administration team (including Finance, Fundraising, Marketing, Personnel). Our administrative staff make the organisation tick, and bring in additional funds for our valuable work. They operate from HeadOffice at Woodchurch. 10% on the Rare Breeds team managing our visitor attraction and farm, looking after the animals and supporting our service users. If we don't have any current vacancies you could always volunteer with us; it's a great way to build skills and get to know the about the work of the Trust.